Why aren't more games set in London? Rich in history and filled with iconic landmarks, England's capital is a charming playground - yet only a handful of titles have properly explored the cobbled streets. 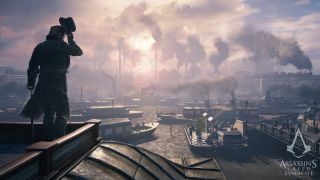 Assassin's Creed Syndicate, 2015's installment in Ubisoft's blockbuster franchise, will take us to a post-Industrial Revolution London of 1868. This is the first major Assassin's Creed entry from Ubisoft Quebec. It's also the first major instalment in the franchise that will let you play as a female assassin, following much backlash over the absence of playable women in Unity's co-op mode. "Being the first AAA title that Ubisoft Quebec was working on, the team knew we wanted to prove ourselves," Scott Phillips tells techradar. The studio drew on help from Ubisoft Montreal while also researching the era. The time period is well documented, and the team used old maps, photographs and drawings for inspiration. They also tapped up historians to learn more about how people moved around the city, how they talked, and get a general feel for the atmosphere of the time. The result is a city that feels like much more than a backdrop. "We treat London as one of the main characters in this experience," says Phillips. "We want to make London feel like a very contrasted city, so when you move around it you feel the difference." From Big Ben to Whitechapel, London's most notable landmarks are here and ready to be scaled. In fact, it seems the only notable landmark of the era that's missing is Tower Bridge, which, as history fans will know, didn't start to be constructed until 1886. "We squish and squeeze and pull and push and move things around to make it as accurate as it can be while maintaining our goal of fluid movement and good street layout," Phillips adds. "It's a mix and match of accuracy and making sure the game is as fun as possible." Without a doubt, players will find Syndicate's vehicles - a new feature introduced by Quebec - one of the most enjoyable parts of the game. Well, vehicles by definition of the time. You'll be able to hijack any horse-drawn carriage you see - Grand Theft Auto style - or hide inside one to evade enemies. You'll even fight enemies on top of them, but don't think you'll just be able to run riot without consequences: if you're spotted causing chaos or not obeying the rules of the road, the police will soon be on your tail. And for once, everyone else will have to learn to drive on the other side of the road. Another tool you'll be using a lot is the rope launcher, be it for quickly propelling yourself to a rooftop Batman-style or making a line between two buildings. This, combined with the downward parkour introduced in Unity, makes you feel more in control and free to move around than ever. It's just a shame that manoeuvring around London's monuments can occasionally get fiddly, sometimes frustratingly so. Techradar played two major parts of the game, one set in Whitechapel (section 3) and another in Westminster (section 7), which gave us a feel for playing as both Jacob and Evie while also exploring different parts of London. One thing that immediately struck us was the tone of the game. The Assassin's Creed series has had a notably dark streak throughout, but Syndicate feels more lighthearted. Much of that comes out in the interactions between Jacob and Evie, the game's two playable characters (and siblings). "I do think there was a conscious effort on our part to make sure both the gameplay and story were a bit lighter," says Phillips. "We wanted Jacob and Evie to be fun characters. We want you to spend a lot of time in their universe, interact with them a lot, so we want them to be characters you want to spend time with."